Hundreds of people gathered Saturday night in Rochester, New Hampshire, in honor of slain journalist James Wright Foley. Foley, who was kidnapped in Syria in 2012, was beheaded in a video posted to YouTube. Terrorist organization ISIS claimed responsibility for Foley's death. A group of Syrian-Americans organized the gathering to send the message that ISIS does not speak for them and is not what Islam is about. "We are honored that you care and love Jim. We are honored that you recognize the sacrifices that he made," said Foley's father, John Foley. "He loved the Syrian people. He was devoted to telling their story and to doing whatever he could to help their plight." 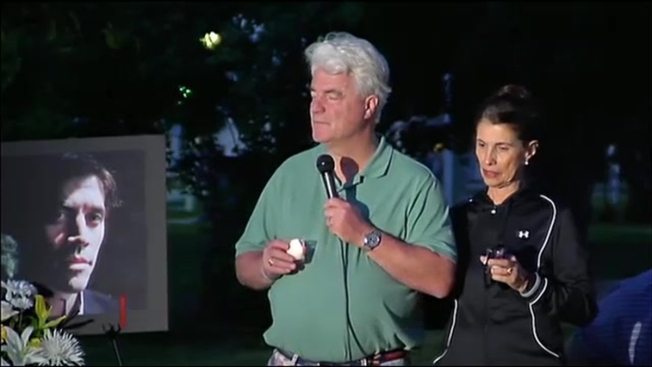 "I pray that we will take up the challenge to love like Jim did and to really work for peace in this world," said Foley's mother, Diane Foley. "Today we were warmed by friends at a candlelit vigil right here in Rochester. It was organized by NuDay Syria, a New Hampshire-based Syrian American humanitarian group focused to bringing humanitarian aid inside Syria and to help displaced Syrians in the bordering areas around Syria. People of many faiths, origins and walks of life came together under a beautiful New England summer sky. We were united by a common desire to keep Jim’s message about Syria’s quest to freedom alive in the world. Many people present spontaneously gave beautiful tributes to Jim. Their words spoke directly to our hearts." A memorial mass is scheduled at 2 p.m. Sunday at Our Lady of the Holy Rosary in Rochester.